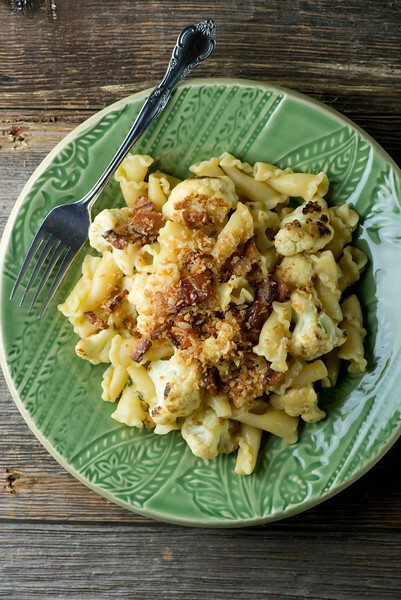 So, one of the reasons behind this recipe for pasta with cauliflower and bacon is that I recently gave myself a challenge to work veggies into everything, and I do mean everything, that I make the Southern husband for dinner. Sometimes that works out as a side dish, like mustard bacon asparagus or a nice Bloody Mary salad. But we are great pasta lovers, and as it turns out, tomatoes are not the only vegetable in town that can be best friends with your plate of pasta. As it turns out, pan-roasted cauliflower with bacon in a buttery white wine sauce is a delightful way to eat your veggies. Let’s make it! It all starts, as so many things do, with bacon. Cook some up until it is crispy and then add some bread crumbs until they too are crispy. This bacon bread crumb thing is going to get sprinkled on the pasta later, which is going to make you want to cry happy tears. Now pan roast some cauliflower florets until they are tender and getting nice dark brown and roasted in spots. Scoop them out and move on to the pasta. I like to do all of this in a deep Dutch oven so that it takes exactly one pot to make all of this, and so the next step is to pour in some chicken broth, some white wine and some uncooked pasta and simmer it all up until the pasta is tender. Can I just give a shout-out to cooking pasta in things other than water? SO. DANG. GOOD. Last but not least, swirl in some butter until it is melted. Add the cauliflower in with a little fresh thyme and give everything a stir. Now ladle it out on to warmed plates, and go get those bacon breadcrumbs. Sprinkle them on. Use every last one of them. Pass out the plates and see how very, very good it can be to be vigilant about making sure we all get our veggies. Place bacon in a large deep Dutch oven or other heavy pot. Cook over medium high heat until just crisp. Add bread crumbs and stir until browned. Remove and set aside. Add oil to pot and heat. Add cauliflower and stir until tender and getting brown in spots, about ten minutes (test the tenderness by inserting a kinfe – it should slide in easily). Remove and set aside. Add pasta, broth and wine to pot. Bring to a boil and then reduce heat to a simmer. Cook until pasta is tender, using the pasta cooking time on the pasta box as a guide. Add more chicken broth if needed. You will want a little extra liquid in the pot when the pasta is done. Stir in butter, then thyme and cauliflower. Season to taste with salt and pepper. Divide among plates, sprinkle bacon bread crumbs on top and serve. Updated from a previously published Framed Cooks post ~ now better than ever! Cauliflower is one of those veggies that I love, but always forget about! This pasta looks delicious, Kate! Love the bacon in here, too! Dang! This looks so good. I love the combination and that you chose a nice “light” white wine sauce. It’s funny, the longer we are married, the more my husband divulges that he just doesn’t like vegetables very much. I bet he would love this dish – I know I would! Thanks for another great recipe! OMG Kate! This looks like the perfect comfort food to me! Love the addition of the cauliflower! It IS such great comfort food…I love cauliflower SO much! 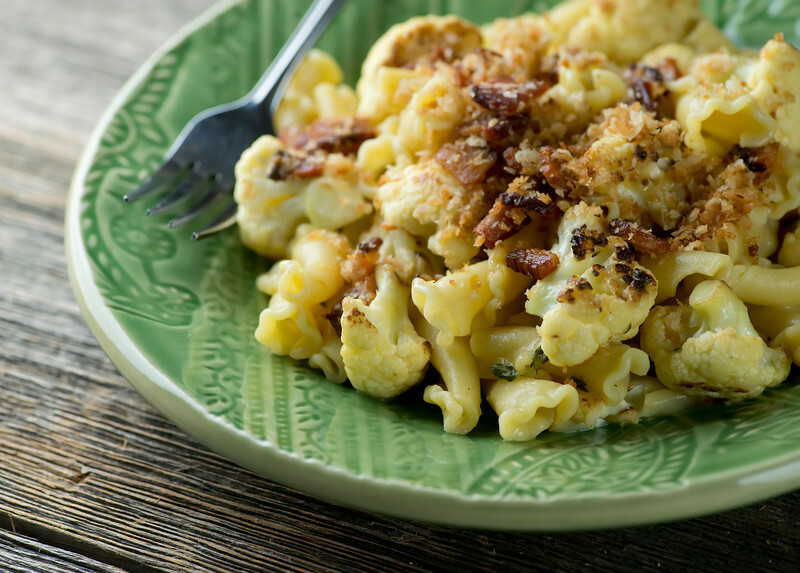 This dish is speaking directly to me, bacon – yum cauliflower – brilliant. Definitely my kind of pasta. One vat coming right up, my dear!